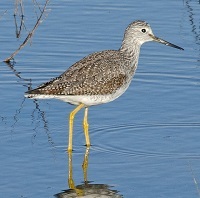 Along the Refuge's Sandpiper Trail, shorebirds can be viewed from a number of spots. During peak viewing times, volunteers with scopes will be available to help answer questions. Free Guided Walks Guided walks will be held on Friday from 12:15pm - 3:00pm and Sunday from 1:15pm-3:45pm. Meet at the Refuge Kiosk on Airport Way. These walks are free and open to the public. The Shuttle Bus A Shuttle Bus will run continuously between Hoquiam Middle School and the Sandpiper Trail from 8am and 3pm on Saturday and Sunday. The suggested donation is $1 per rider. 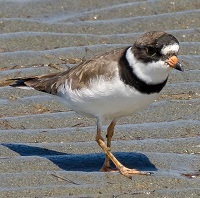 Information on shorebird species at Grays Harbor. 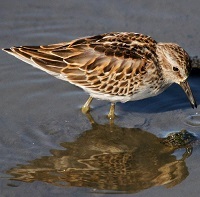 At the Refuge, shorebirds can be viewed best during the period about 3 hours before to 3 hours after high tide. During high tide, birds are closer and more concentrated for better viewing. However, weather conditions such as wind and storms can greatly alter tides in Grays Harbor so good shorebird viewing is dependent on a number of factors and can be unpredictable. For coastal viewing, tidal cycles are not as critical. High tides along the coast are about 20 minutes earlier than at the Refuge. 1) Heavy rains in previous days cause rivers and hillsides to rapidly drain into the estuary, which can add to tide level. If soils are saturated count on quick, heavy runoff. 2) On-shore winds push water into the dead-end (bathtub-like) basin and as it fills, mudflats become inundated and can flood into the saltmarsh. Of course strong winds exacerbate the situation. 3) Low atmospheric pressure (associated with stormy conditions) allows tide waters to rise vs high atmospheric pressure which pushes down on the water surface. These conditions, often in combination, cause the tide to come in as much as 2-3 hours early and cause tide levels to be above predicted tide peak levels. Check the predicted tide level for 'Aberdeen' and consider the recent and current weather conditions to plan an appropriate arrival time. Plan your trip and expect to spend a few hours to maximize viewing potential. Generally tides at or near 8-8.5' are good for consolidating shorebirds into limited area of mud flat and make viewing easier. However, higher water levels (predicted or not) cause water to cover more mud. So that means go early to see them before water covers the mudflat and stay until the tide recedes to see the birds come back and resume feeding.